EACH ORDER IS CUSTOM BUILT FROM FRESH ROASTED BEANS. Sparkplug Coffees are made from premium Arabica beans sourced through direct and fairly traded methods. Roasted every week in Toronto, each order is custom built to your specifications. For the Freshest taste, drink up within 6-8 weeks of receiving a Sparkplug Coffee order. Taste the difference fresh-roasted makes! We ship every week! Order now and it'll be on its way to you in a few days. Try one of our blends out, or put it on Autopilot & sign up for regular coffee delivery. Change the frequency, pause or cancel anytime – no hassle. Our affordable coffee prices include taxes & shipping anywhere in Canada. Amazing coffee, delivered to your door, whenever you want it, starting at less than 50¢ per cup including any taxes & shipping anywhere in Canada. We ship via Canada Post to any address in Canada from coast to coast to coast. The freshest taste comes when you grind just before brewing. But that’s not always possible and we understand. So when you place your order, let us know if you want your coffee ground and for what kind of coffeemaker. From French press to espresso grind, we can do it! Look up the right grind for your coffeemaker in our handy Coffee Grind table. We absolutely want you to be happy with your Sparkplug Coffee. If you don't love one of our coffee blends, let us know within 30 days of its ship date and we will replace it with another coffee. Contact us by email or our toll-free number and we'll work something out. SPARKPLUG COFFEES ARE MADE FROM PREMIUM ARABICA BEANS, DIRECTLY SOURCED & FAIRLY TRADED. Choose from one of the Sparkplug Coffee signature blends or a seasonal coffee that changes every few weeks. Time to take a Road Trip! A lighter tasting, sweet & balanced coffee, this one is for connoisseurs. Organic Ethiopian beans are the secret to this sweet and balanced coffee. Road Trip is our most delicate coffee with hints of blueberry, jasmine and raisin. Best for: black coffee, Aeropress, pour over, Chemex, cold brew. Kick start your day with a great brew! Medium roast, designed for drip & filter coffeemakers. Medium roast. Balanced taste with hints of toasted nuts, caramel, cocoa, and berries. Smooth & rich from Central & South American beans & zesty from a dollop of Ethiopian beans. Delish! Especially good in: automatic coffeemakers, manual / pour over, filter coffee, Aeropress. Take your taste buds around the world! A dark roast, espresso-style coffee that also is great brewed. Dark, smoky-sweet, complex. Smooth and suave. This dark & delicious blend mixes in organic beans from all major coffee growing regions - Africa, South America, SE Asia, and Central America. Recommended for: espresso drinks, moka pot (stovetop espresso), French press. The Unleaded decaf blend is so tasty it's hard to believe it's decaf. Roasted and blended espresso style for a rich, bold taste. A decaf for coffee lovers! Unleaded Decaf - beans from around the globe, roasted on the darker side, blended to create a delicious, full-flavoured coffee. Great brewed, amazing as espresso. A great coffee at any time of day. Half the caffeine & all the flavour. Smooth, rich with notes of milk chocolate & toasted nuts. Half the caffeine so you can drink twice as much! The Low Voltage mixes our Unleaded Decaf coffee with the Fuss Studio Blend. Smooth, rich, roasted on the darker side of medium, the Low Voltage is a coffee you can enjoy all day long. Our limited edition coffee, something new every few weeks, always something special. What's in season? Just click on the coffee bag above or the Select button below to find out this season's special coffee. It could be a single-origin or a blend of special beans from around the world. Whatever it is, it's just here for a few short weeks so don't miss out! Our strongest brew. A tasty blend that'll get your motor revving. Bullit Custom Dark is a coffee to match our sense of humour - dark but not bitter. Hand blended and made with super fresh, super strong, super premium Arabica beans. Mostly South American, the exact beans change depending on what is in season to fit this dark roast blend profile. Recommended for: You - if you love a dark, rich, bold and strong coffee. Works well in any type of coffeemaker, including espresso. Served up with love at Fuss Hair Studio in Toronto's Leslieville and now available for your kitchen, too! What the Fuss? Styled expressly for Fuss Hair Studio. Smooth and balanced, medium roast, this blend of South and Central American coffees makes an excellent cup of java. Recommended for: filter brewed coffee - manual or automatic. A great choice for offices and sharing, it's a real crowd pleaser. 200 g each of 4 distinct coffees - 3 of our signature blends plus the current Seasonal. Find your favourite! All of our coffees sound good? Not sure which to try? Pick a sampler & try 3 of our signature blends plus the current seasonal coffee. the Classic Sampler or the Super Custom Sampler. Each has 200 gram bags of 4 distinct coffees so you can find your favourite. 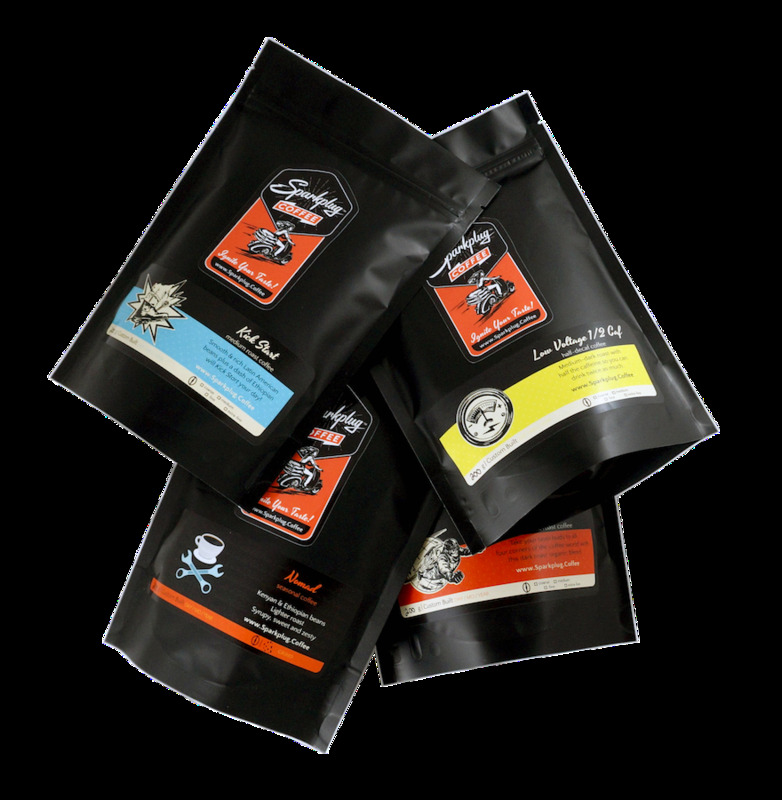 Any of the Sparkplug Coffee blends can be purchased in Standard (300g) and large (900g) sizes. Prices include taxes & shipping anywhere in Canada. Coffee is roasted, custom blended and packed at the start of every week. Whether you choose a one-off purchase or set it on Autopilot to send fresh coffee every 2, 3, 4 or 6 weeks, your selection arrives a few days after ordering, while at its peak taste and freshness! GET THE MOST OUT OF EVERY SINGLE BEAN! We've done the research for you & picked the best brewing equipment and serving accessories so you can enjoy quality coffee from your home or office. Get the most out of every single bean! We offer the best in brewing equipment and serving accessories, so you can enjoy quality coffee from your home or office. Plus awesome swag! Check out our Gear page for more great stuff. It's Time For Your Favorite Cup of Coffee To Come From Your Kitchen! BEANS - use FRESH roasted Sparkplug Coffee. Fresh is best - drink up within 8-10 weeks of roasting. Or within 2 months of receiving your Sparkplug order. GRIND - pick the grind that works best with your coffeemaker. Refer to the Sparkplug Coffee grind chart if you're not sure. MEASURE - use the proper proportions of coffee to water. We recommend 1 Sparkplug Scoop (2 Tbsp / 30 ml) of ground coffee per 8 oz / 200 ml of water. WATER - use the same WATER you’d drink straight up. TEMPERATURE - use HOT WATER, not quite boiling. Coffee nerds say 91-96ºC or 195-205ºF. BREW TIME - follow the TIMING recommended for your brewing equipment. STORAGE - keep your coffee in an AIRTIGHT container in a cool, dark spot. No, this does not include the fridge or freezer. ENJOY! Drink up while it is hot and fresh. GET THE FULL GUIDE - Sign up for Sparkplug Coffee News to get our full report Make Every Cup Great with more details on each of these 8 tips.